I woke up early and saw a bright blue sky out. Since I really didn’t have much of an idea where I was, the first thing I wanted to do was to go outside and take a walk, and see what the island looked like, and get my bearings. I needed to get my sense of direction in place, and get a feel for where I was. There was a brochure in the front office, and the lady there was helpful in pointing out which village I was in, and told me since there was really only one main road on the island, there was no way to get lost. I saw that I was kind of in the middle of the island, and that seemed to be a good place to be. I walked out the door, turned right, and began my walk. 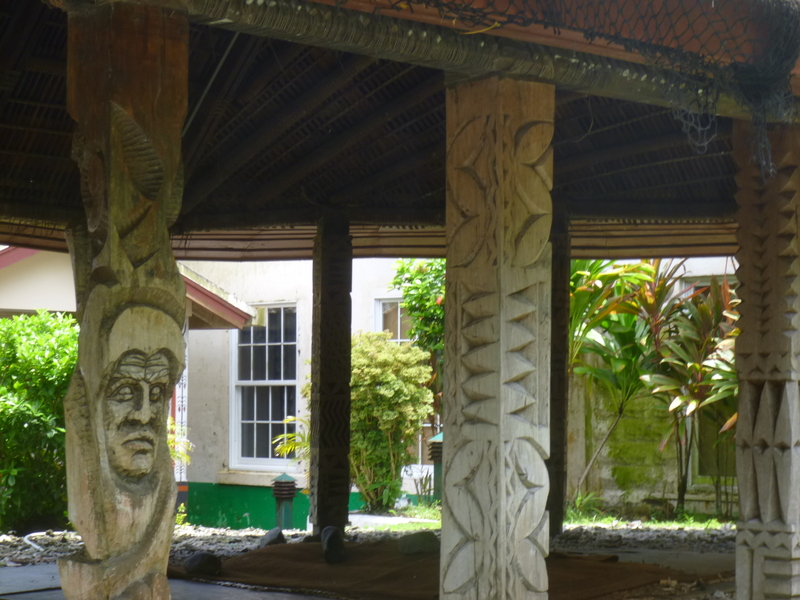 A short history – around the turn of the last century, the Samoan Islands were divided, due to international rivalries. The western islands went to Germany, and the eastern islands went to the United States. 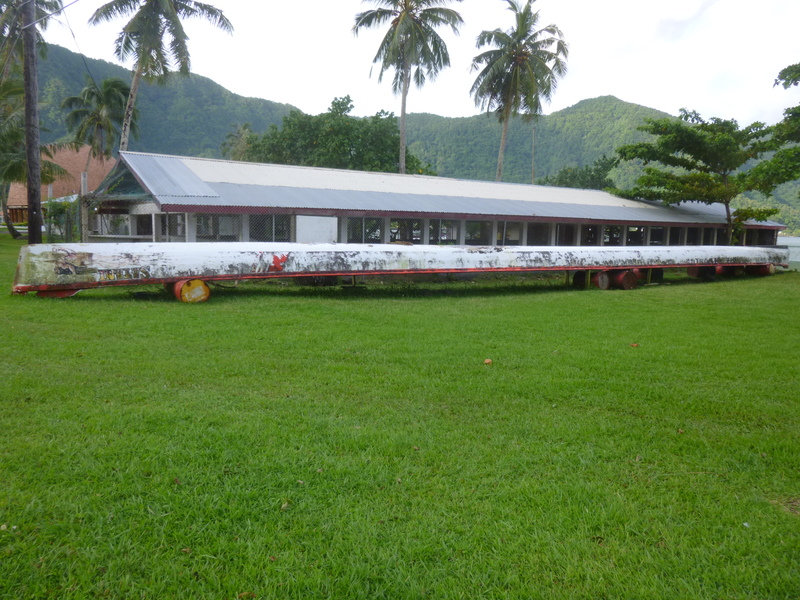 They were called Western Samoa and Eastern Samoa respectively. 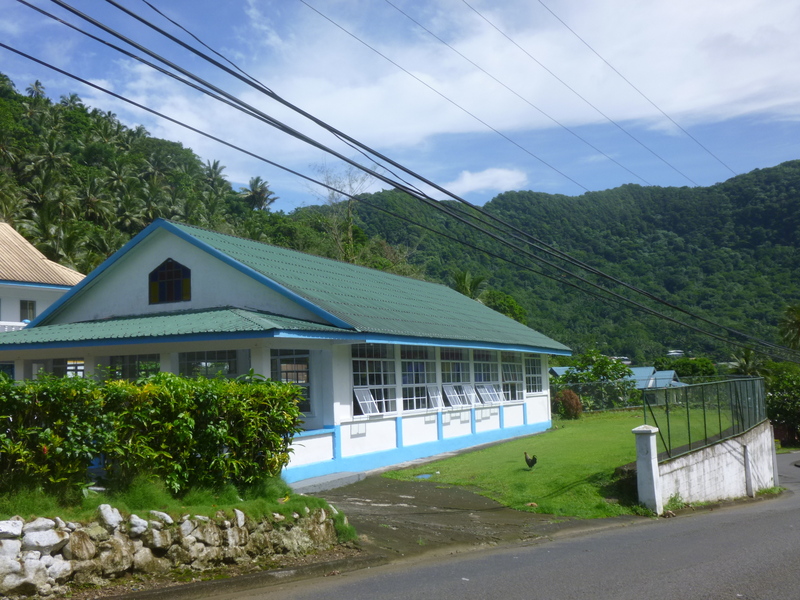 Somewhere along the way, it was decided that Western Samoa would simply be known as Samoa, and Eastern Samoa would become American Samoa. 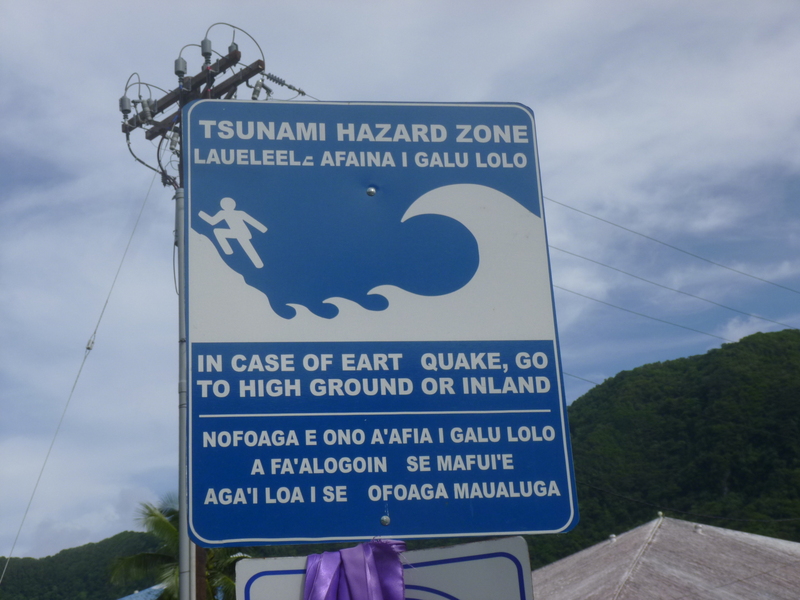 American Samoa is one hour behind Hawaii’s time zone; Samoa (Western) is on the other side of the international dateline, so they are a full day behind American Samoa, which seems a bit odd for the same group of islands. 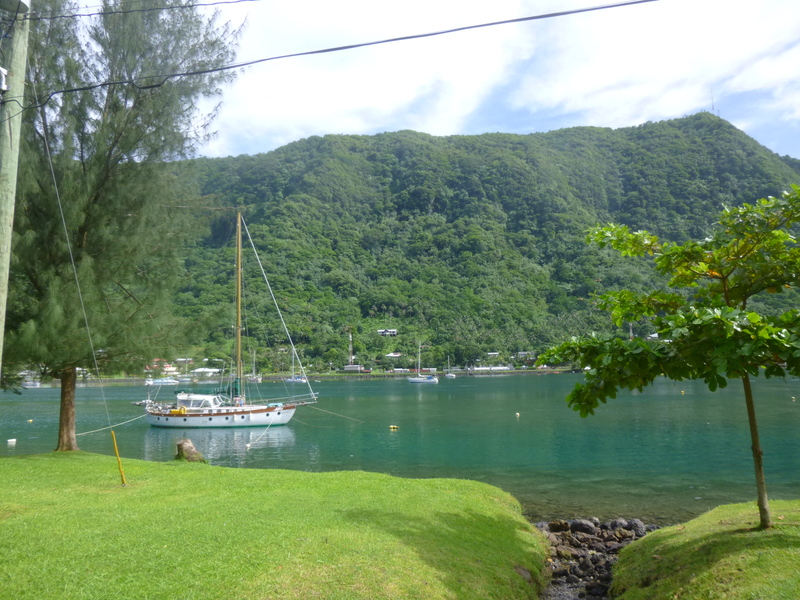 Several islands make up American Samoa, and Tutuila is the main island, where the vast majority of people live. The island is only about 25 miles long from west end to east, and less than 10 miles wide (and a good deal less than that in places.) I wondered how and where I’d get my walking done! As I began that first walk, I had the Pago Pago (pronounced Pongo Pongo-learned the hard way!) 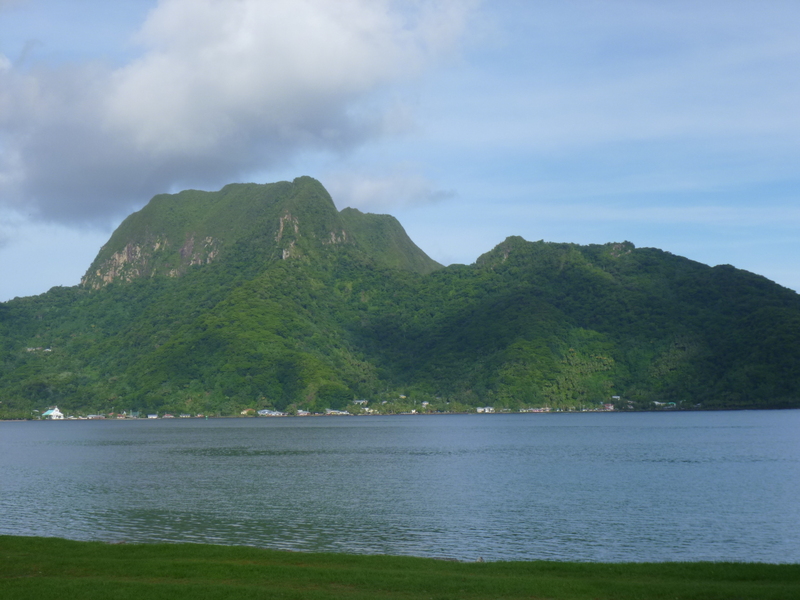 harbor on one side of me, and the steep, rugged, volcanic mountains on the other side of me. It was already hot and humid. The main road runs the length of the south side of the mountains. The mountains looked nearly impenetrable, and they don’t leave much room down at sea level for roads, businesses and homes! 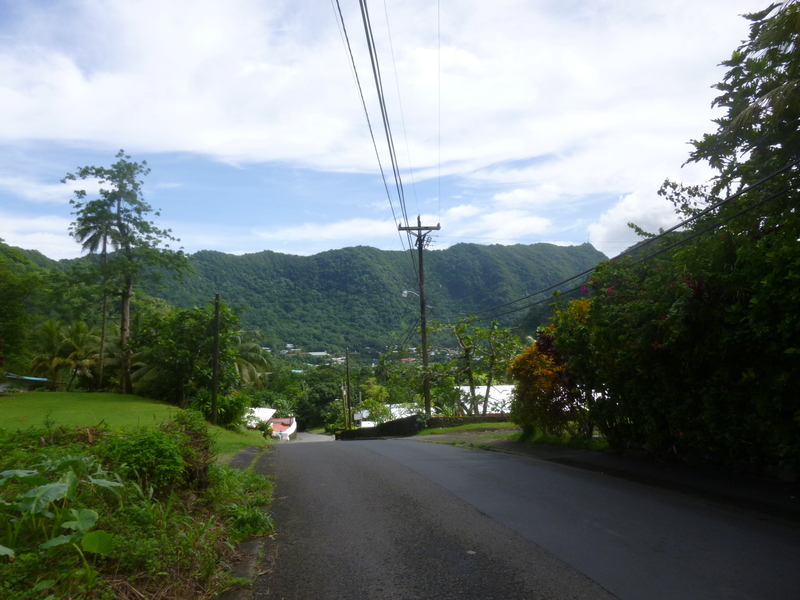 And they’re so steep that there are only a few roads that cross a pass to a few villages on the north shore. There is no road running along the north shore – a village might only be 3 miles away from a neighboring village as the crow flies, but it’s an effort to get there by car or bus. The street was noisy and busy, and there were lots of small, colorful local buses, with maybe 8-10 rows of seats. It seems to be the way many people get around. The buses congregate at a marketplace, and they have little signs in their windows that tell you which village they’re headed for. 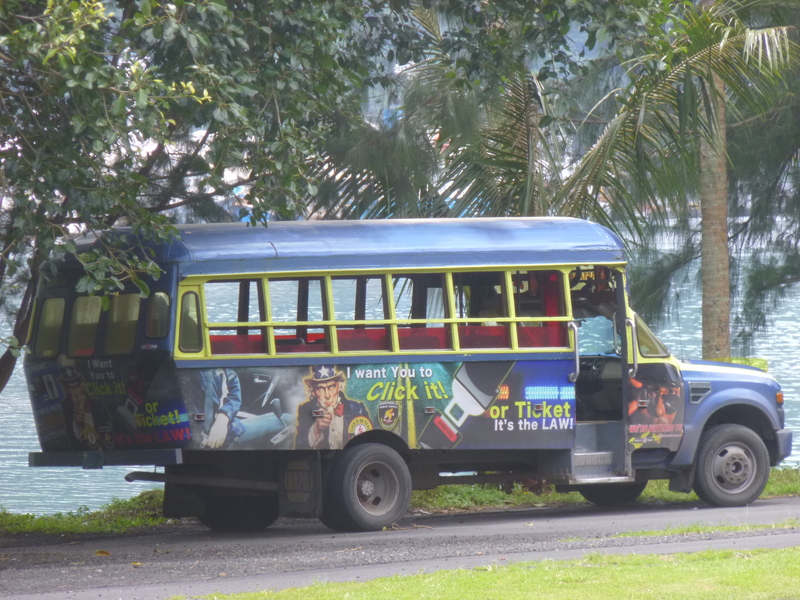 Some of the buses look a bit rickety, and a few seemed to have smaller front tires than rear tires. No two look alike, and windows are always down (no a/c) and music is usually blaring. I knew I’d be riding them before my week was up! 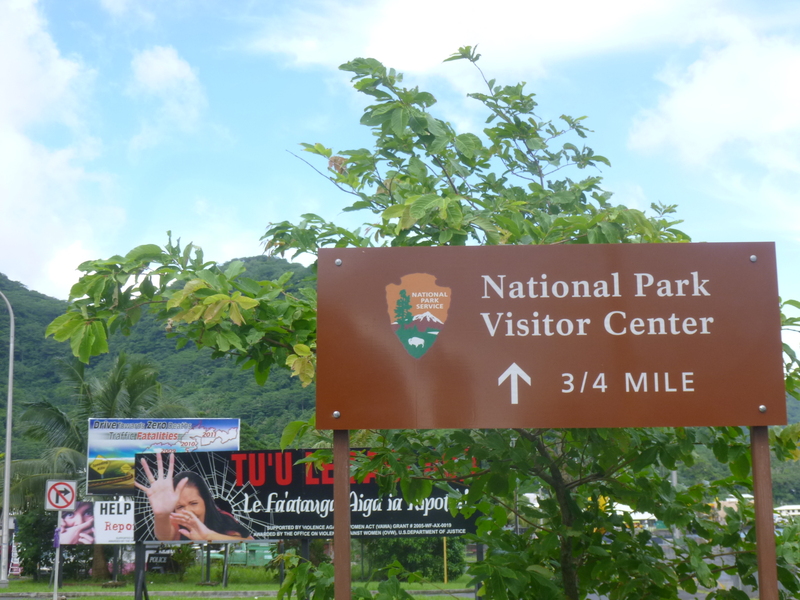 As I walked a bit farther, I saw a national park sign, saying the visitor center was 3/4 mile up the road. 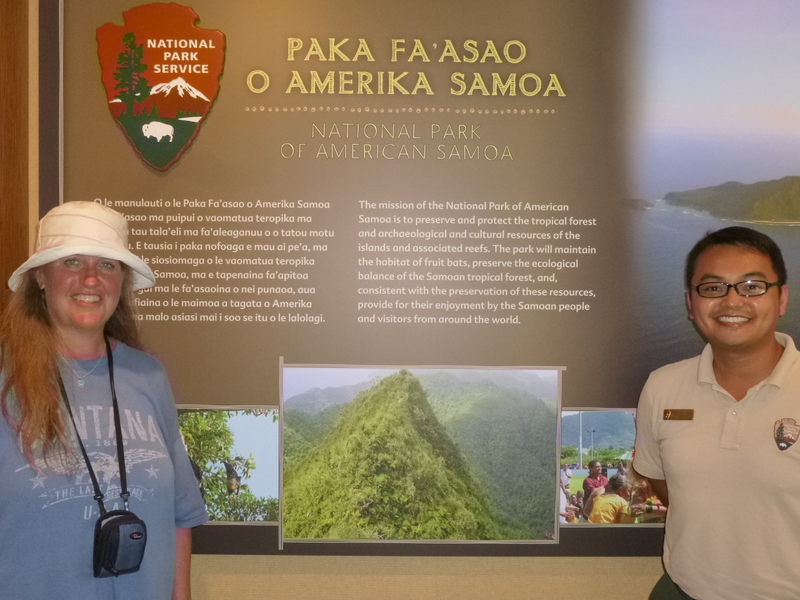 That became my first destination – the comforting familiarity of the National Park Service! I love those brown signs! But I walked right past it, absorbed as I was in my surroundings. In addition to the heat, and the bustle of the street, was the one thing that bothered me most on the island – all the stray dogs. They’re everywhere, and many of them don’t appear to be the healthiest of dogs. They’re in the roads and everything, and I worried I was going to see them get hit. But they know the streets and get out of the way. They do not seem to be pets, and although some bark and give chase for a while, many seem to ignore people. I was happy they weren’t going to try to come up to me for attention. As I walked on a bit, realizing I’d walked more than 3/4 mile, I saw another National Park sign, pointing up one of the roads that goes over the mountains. I was a little confused, but started up the hill. 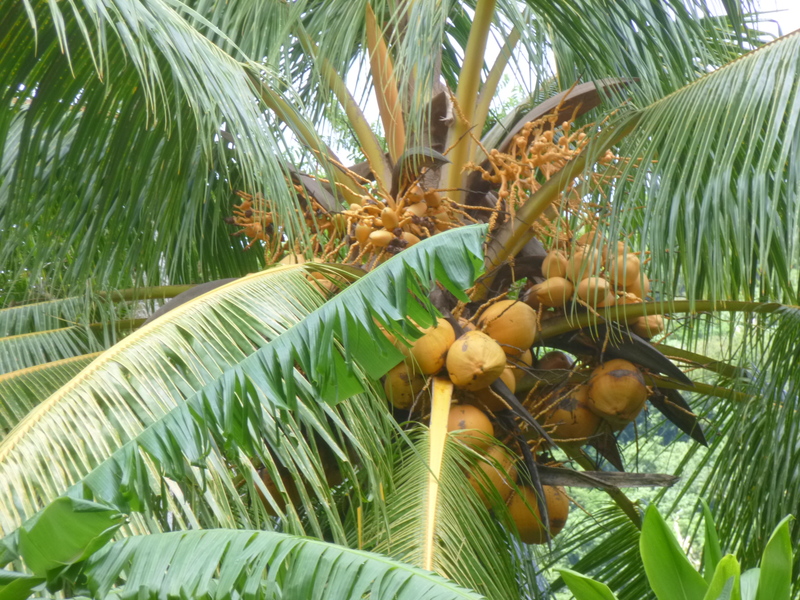 I passed a banana plantation (I would call it a small banana orchard, but they all seem to be called plantations here) and some people out selling fruit in their yards. After I trudged up the side of the mountain for quite a ways, I passed a lady on her way down the mountain and I asked her about the national park. She said I was heading for one of the trailheads, and that I had passed the office back in the village. I walked uphill a bit more, then decided to turn around. I bought some bananas from one of the ladies, and made my way to the visitor center. 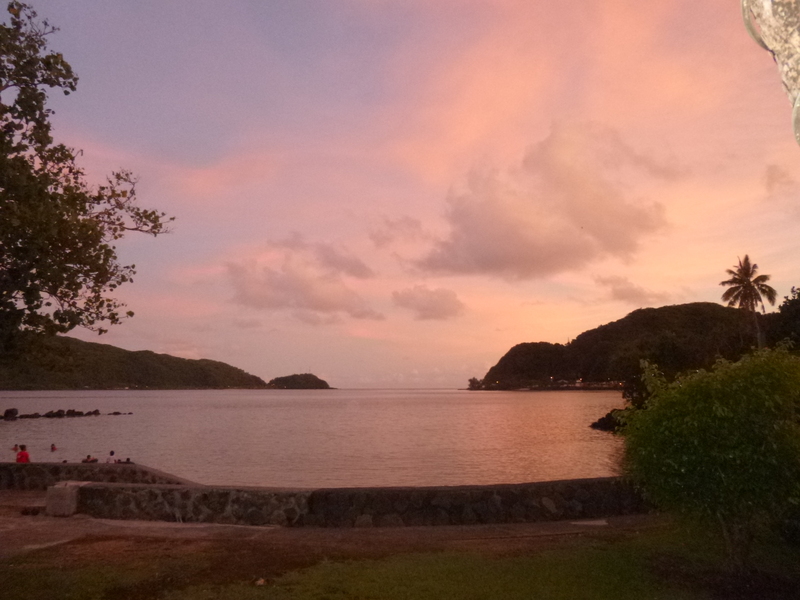 American Samoa National Park is, of course, one of the least-visited national parks. They are preserving a great deal of rainforest land on the north shore, as well as some of the surrounding reefs and underwater habitats. They don’t get a lot of visitors from the United States, and they were very happy to answer my questions, and tell me about the park and its trails. They had some good maps too, and they had a roomful of exhibits and information. I decided to make my first donation there since I support their efforts to educate people about their surroundings ( and also partly because they were so welcoming and helpful to me in unfamiliar surroundings!) I didn’t have either my checkbook or my national park passport with me since I hadn’t planned on running across the Visitor Center, so we made plans for me to return later in the afternoon. They’re not open on weekends, and Monday is Martin Luther King Day, so all federal offices in American Samoa will be closed. (The kids were going to get the day off school too, but I have to wonder how many if them know who MLK is!) I started the walk back to the motel, and popped into one of the numerous local markets to pick up sandwich fixings, carrots, diet coke and water. 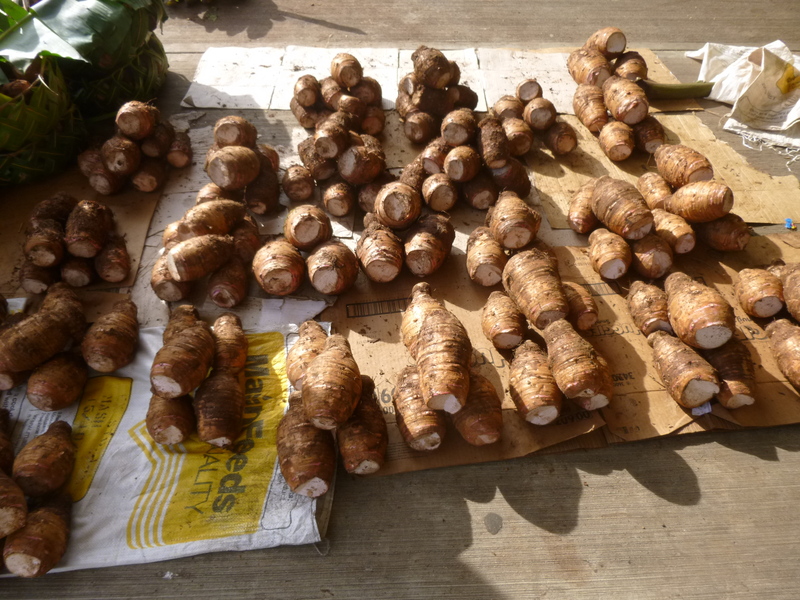 Most of the villages have a little market, and although there’s not a lot of choice, they have the basics. Prices are a bit higher for many groceries, but getting them into the island no doubt accounts for that! I had walked nearly 6 miles on this first excursion out, and was tired and dripping sweat – definitely not used to this weather! I was happy to get back to the motel to have a bite to eat (I actually have a fridge and microwave)and to hide out from the sun during the hot part of the day. I got unpacked and organized. A drenching rain shower came through and I thought that might help with the humidity. But when I went out later, it seemed even more humid! I walked back up to the Visitor Center in the late afternoon, and a bunch of high school kids were there. The national park is trying to get an internship program going for them, to help generate some interest in their island. Both the guys and girls were dressed very similarly – white shirts and long wrap-around skirts (called lava-lavas) with their school emblem down by the hem. I had noticed a lot of men wearing these wrap-around “skirts” – usually a solid color for them with a patterned Hawaiian type shirt. I had read that the Samoans were a modest people – no 2-piece bathing suits, not short skirts or shorts, and no bare bellies. And the guys don’t wear pants that are halfway falling off of them! And many of the ladies wear an outfit that consists of a long tunic top over a long skirt – they’re custom-made in one of the dozens of “sewing shops” on the island. They all have long hair and wear it in a bun or a topknot, frequently with a flower (real or fake), and no bangs and very little makeup (why bother – it’ll just melt off in the heat!). I got distracted – back to the national park. I bought a few things and made my donation, and we talked about the hikes once more. I had decided on a long one for tomorrow, and was assured it was very well marked, and I couldn’t get lost! I walked back to the motel, and then kept going a little farther in the other direction, where I found another market that seemed to have a wider selection of items. I passed a couple public beaches and families were out enjoying a swim. This is the quiet side of the motel – the road eventually leads to the crowded western side if the island, but it twists and turns along the sea, and there’s a sidewalk the whole way, so I knew I’d be able to do miles of walking there. I got back to the motel and ended up with 10 miles for the day. I took a quick, refreshing dip in the ocean – the motel has its own little beach, and somehow it seems like the water is saltier here because it was so easy to float and it was almost hard to duck completely under – I just bobbed right back up! I was kind of worn out, and just decided to fix another sandwich, and to start the book I bought from that retired colonel that I met back at the Alabama Battleship Park. I just want to say that, it’s an inspiration reading about your cause and all the donations you give out along the way. 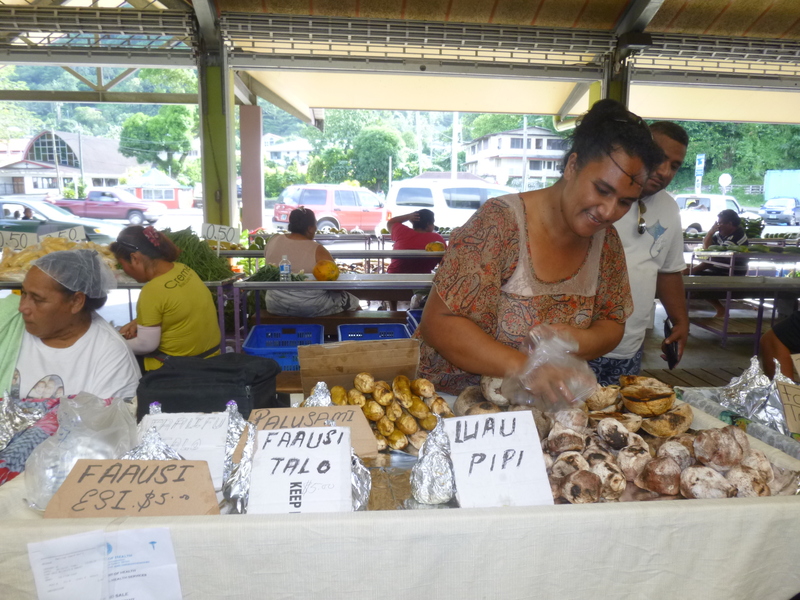 I smiled the whole time I was reading your blog about American Samoa since I’m from there (the village where the market is). I do enjoy my morning & evening walks towards the coastline on the west side. It’s my time to think and meditate. I’m going to miss it when I go back to the States though. May God bless you and keep you safe! Thanks for the good read not only Samoa but the islands in the pacific.